On September 5, 2018 Cory Whitney took part of in an expert panel at the Welthungerhilfe, in Bonn, Germany, to help create awareness about the need for holistic and inclusive research methods. On behalf of ZEF he presented a call for more transdisciplinarity in Agroecology. The presentation was based on a recently published paper in the international journal and online platform Rural211, part of a recent collaboration between the University of Bonn’s Center for Development research (ZEF) and Department of Horticultural Sciences. Agroecology can be categorized anywhere on a continuum from science to activism and from being about ecology or agriculture. It includes a collection of different disciplinary fields, ranging from agriculture and ecology to political theory. This dynamic field offers much-needed participatory approaches for agricultural research and interventions, which often have a strong focus on production. Adopting more holistic and transdisciplinary research approaches in agroecology could make it a major part of achieving sustainable development. Agroecology as a science arguably has its roots in the book ‘Farmers of Forty Centuries’ by F. H. King2, a travelogue of his visit to East Asia around 1900. King was on sabbatical from his work as professor of agriculture at the University of Wisconsin–Madison and documented the agricultural methods and practices that he saw on his journey. It was not until much later, in the 1960s, that W. Tischler first coined the phrase in German Agrarökologie3 and established the field as a way for scientists to apply the ecological lens to agricultural landscapes. In the 1980s up to the present the Berkeley Professor Miguel Altieri extended the term to include additional contextual ethical considerations, namely that: 1. smallholder farmers should be the focus of agroecology research since they produce the majority of agricultural goods, provide the majority of food for the world’s population and will continue to do so into the future, 2. research in agroecology should seek to create benefits of immediate use to smallholder farmers and 3. issues related to social justice should be a major focus of agroecology and should seek to create fair and sustainable conditions for smallholder family farmers. The basic contention of the talk was that the term ‘agroecology’ is rather nuanced and should be understood in a dynamic rather than a simplistic way. By understanding the various facets of the term, development and scientific communities can be much more efficient and coherent in applying the tools in practice. Furthermore, by making transdisciplinarity the main methodological theme of agroecology, interventions and research foci can be tailored by and for the communities that they are intended to serve. The basic premise of this argument is the common sense notion that research gaps and intervention needs cannot be identified without talking to farmers and they cannot be addressed without working with farmers. The Welthungerhilfe workshop was attended by around 30 participants in Bonn, and remotely attended by 15 of Welthungerhilfe’s international country offices, including Uganda, North Korea, Afghanistan, India and Cambodia, who asked questions and made statements during the panel discussion. Read the Rural21 Article online. Biber-Freudenberger, L. et al. 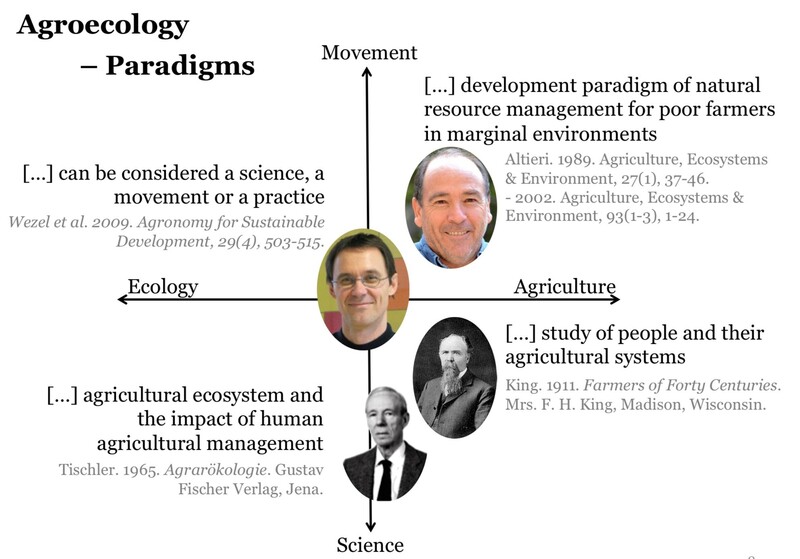 More inter- and transdisciplinary research needed in agroecology. Rural 21 52, 31-33 (2018). King, F. H. Farmers of Forty Centuries, or Permanent Agriculture in China, Korea And Japan (Mrs. F. H. King, Madison, Wisconsin, 1911). Tischler, W. Agrarökologie (Gustav Fischer Verlag, Jena, 1965).